SINGAPORE - The Straits Times ran a story earlier on the “coolest” offices in Singapore - fun and innovative workplaces that inspire staff to come up with great ideas or just help them chill. Now our readers have nominated more workplaces in Singapore that they think are as cool - or even cooler. 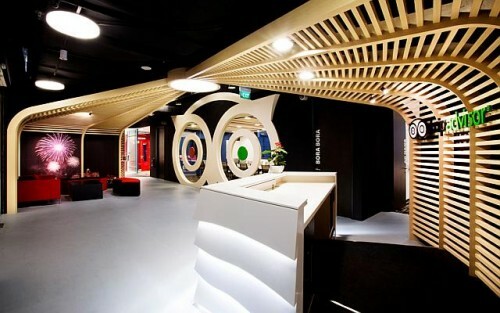 Every day is a holiday at TripAdvisor’s Asia-Pacific headquarters in Cross Street. The travel website’s office at the PricewaterhouseCoopers building is home to an eclectic blend of design elements as well as tons of open spaces and natural light – inspired by the idea of travelling. “We hope that the office makes everyone feel like they're on a trip every day, revitalised and renewed to tackle the everyday challenges,” said a TripAdvisor spokesman. Employees can find their way using the road directional signages that are planted along passageways, which lead to various departments and resource areas. The pillars are also erected with warm-lit lamp posts to conjure images of walking through London’s scenic Hyde Park. Red phone booths, which can accommodate one table and two persons, are used for smaller discussions. True to its wanderlust theme, a world map collage reminiscent of a travel scrapbook is emblazoned on a wall in the pantry. Here, staff can loosen up over meals or informal discussions. If you work at consumer goods giant Unilever Asia, chances are your everyday needs - from nutrition to hygiene to personal care - are in good hands. Employees at the company’s office in Mapletree Business City in Pasir Panjang can get a haircut at the Tigi Hair salon, or get their beauty fix at the Pond's Beauty Spa – all at special staff rates. They can also kick back with Ben & Jerry’s ice cream and milkshakes at an in-house cafe, or take a mid-day dip at the infinity pool, which is part of the Fitness First gym facilities. Membership at the gym is free for Unilever employees. Writing comments is one thing the social networking site takes quite literally. Staff and guests alike at Facebook Singapore’s office in Cecil Street are encouraged to scribble or doodle on its floor-to-ceiling wall, which has the Facebook logo and the words “write something”. Other walls in the workplace feature original street art by Singaporean artists. The company also helps fill the bellies of its employees with a cafe that is as well-stocked as a convenience store – with cup noodles, soup, salads, sandwiches and a wide range of snacks and biscuits - all for free. To top that off, there is free beer and wine. Dreary meetings seem to have no place at Fixx Digital, a homegrown digital design agency which shares an office building in Toa Payoh with five other media-related companies. Its meeting rooms come in various themes, including one named “Toy Room”, which is filled with snug, brightly coloured bean bags and a full-length whiteboard wall – to spur brainstorming and creative discussions, said managing director Darren Lee. Another, called the “Cinema Room”, comes with plush couches, a big-screen television set and a surround-sound system. The walls are also lined with movie posters of office favourites. It’s hard to miss a Harley-Davidson bike on the roads, with its distinctive roar and old-school chopper-style frame. It’s even harder to miss one in the motorcycle company’s Asia-Pacific headquarters at Penang Road, where employees and guests are welcome to sit on some of its latest and most iconic motorcycles found throughout the office. Staff who travel to work by motorcycle can stow their helmets away in the helmet lockers. There are spare helmets for those looking for a spontaneous jaunt as well. The firm also has a small fleet of motorcycles just for its employees to use, be it for familiarising themselves with the products or for team rides. “Harley-Davidson is all about fulfilling dreams of personal freedom through our unmistakeable brand and product experiences,” said Mr Marc McAllister, vice-president and managing director for the firm’s Asia-Pacific operations. To accommodate its growing presence here, Harley Davidson is moving to a new office early next year, which will include more employee-friendly features such as a brand new gym.